Looking for a new way to make your name stand out? Try our new Akuafoil products! 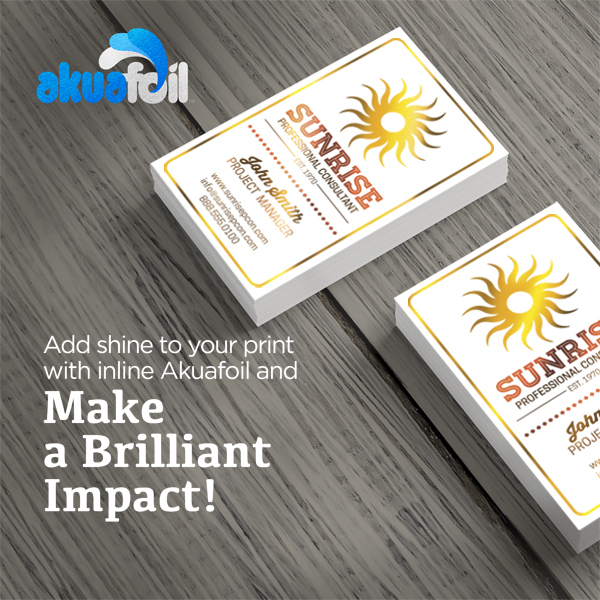 Akua gives you a wide range of CMYK colors with a sparkling foil finish and an ideal reflection that is priced to give you a true competitive advantage. State-of-the-art features allow you to produce large solid areas as well as reversed out areas of foil. You can produce foiled half tones, gradients and have multiple colors in foil on the same design. The design possibilities are limited only by your imagination! Contact us now for a quote on your next Akuafoil order!